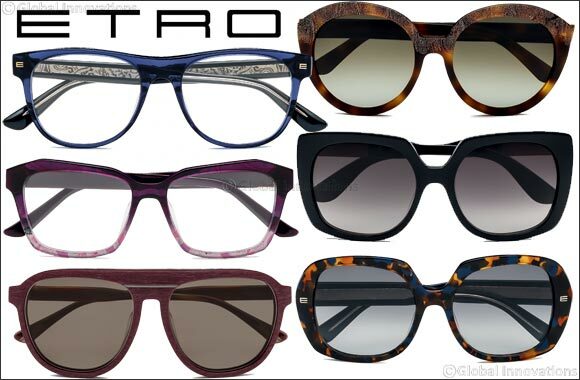 ETRO eyewear collection - Iconic paisley, unusual color combinations & sophisticated designs. Dubai, UAE, November 15, 2016: For its new Eyewear Collection, Etro, a brand historically synonymous with Italian-made elegance, demonstrates passion for prints and craftsmanship. Iconic Paisley, unusual color combinations and fine materials, combined with modern and sophisticated designs, evoke the world of Etro, where creativity, innovation and tradition come together in perfect harmony. This strikingly aesthetic acetate model features an ample, rounded design. The temples and the upper section of the frame front are customized with distinctive Paisley pattern effects that fade into the solid color lower section. The gold metal Etro logo is displayed on the temple. The colors are available in matte tones of Black, Havana, Blue and Bordeaux. This silhouette has a strong character and ample volumes, featuring a highly feminine boxy acetate frame front. The temples are adorned with a special gold detail, decorated with the distinctive Paisley print. Available in Black, Havana, and Bordeaux. This vintage model has a boxy and oversized design. The brand’s iconic gold metal letter E makes the frame truly distinctive. The temples have a metal rod customized with the embossed Paisley pattern. Sophisticated available colors: Black, Havana, Blue Havana, and Bordeaux Havana. This iconic masculine aviator model is made from acetate that evokes the grain of wood and is adorned with sophisticated metal circling, which makes the glasses truly striking. Available colors: Black Horn, Blue Horn and Bordeaux Horn. This customized acetate frame has an unusual geometric form. The solid and bold color of the temples contrasts with the light colors and Paisley pattern on the frame front. Available in a wide variety of colors: Fog Paisley, Burnt Paisley, Purple Paisley. This masculine acetate model has a classic design. The temples are embellished with a metal rod customized with the Paisley pattern. Solid colors: Black, Havana, and Blue.